A night of celebration turned into an emergency evacuation for hundreds at a luxury hotel in downtown Dubai on Thursday. Nearly the entire length of the 63-story Address Hotel, which houses over 600 apartments and more than 200 additional rooms, was engulfed in flames just hours before residents and guests planned to ring in the new year. And while the flames have been contained, according to authorities, figuring out the cause of the fire has not been as quick. 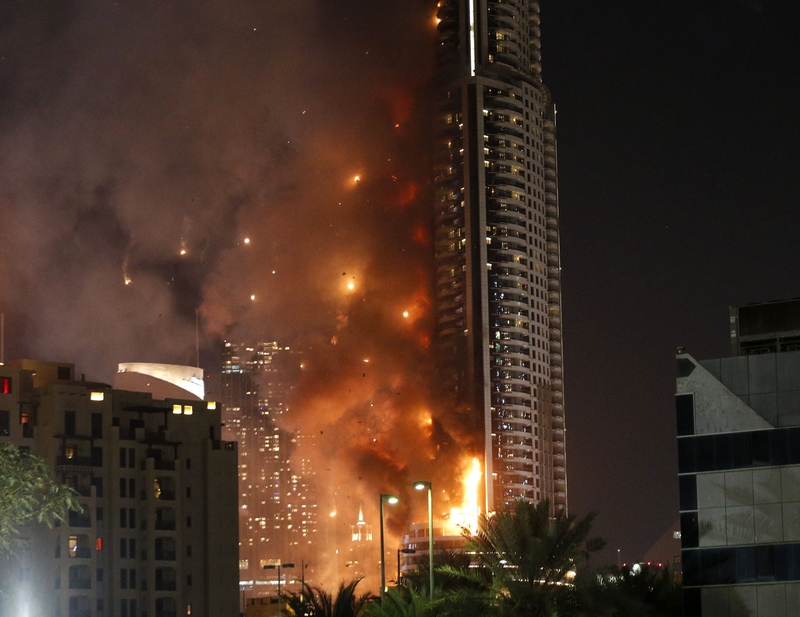 Was the Address hotel fire in Dubai an act of terrorism? Authorities who are working on-site haven't made reference to suspicion of terrorist activity, though the reason for the inferno's starting is not yet clear. A Dubai Media Office spokesperson stated that the fire originated on the 20th floor of the hotel, Al Jazeera reports, and the flames have only affected the outside of the hotel structure. An eyewitness told the Mirror UK that he had been informed it was an outdoor balcony upon which the fire began. "Internal fire extinguishers are preventing spread of fire inside the hotel," the spokesperson stated. A proposition that the fire could have been started intentionally is not far-fetched. The hotel sits nearby to the Burj Khalifa, the world's tallest skyscraper at over 2,700 feet high. And holidays and celebratory gatherings can be favorable targets for acts of terrorism. There are, however, plenty of other possible causes for an apartment fire: candles, grills, and lights are commonplace and could just have easily led to the balcony's catching on fire. Though usually illegal outside of officially-run events, watching or setting off fireworks are regularly part of New Year's Eve celebrations around the globe. Officials have not yet made any mention of outdoor lights or firecrackers as potential causes for the blaze. The Burj Khalifa fireworks display and light show, which was expected to make use 1.6 tons of fireworks and 400,000 LED lights, took place as scheduled. "There are no injuries, thank God ... of course, it will not affect the celebration," general director of the Dubai Civil Defense, Major General Rashed al-Matrushi, told Al Arabiya TV after the hotel was evacuated and firefighting squads went to work on putting out the blaze. Though police closed off the surrounding area, efforts to extinguish the hotel fire became a spectacle as hundreds watched from a safe distance. Dubai citizens may not have lost out on the opportunity to mark the holiday with the fireworks display, but the evening likely stood out as memorable more so for the awful blaze that burned nearby.